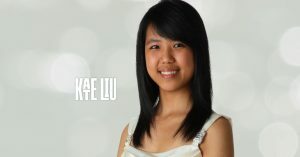 KATE LIU began playing piano at the age of four. At six she was admitted to the gifted music program of the Yamaha Music School in Singapore. When she was eight, she moved with her family to the Chicago area, where she studied piano with Alan Chow, Micah Yui and Emilio del Rosario in the Academy program for talented young pianists and string players at the Music Institute of Chicago. She is currently pursuing her Bachelor of Music degree at the Curtis Institute of Music under the guidance of Robert McDonald.